Anyone can learn Chinese grammar. With the a good dose of motivation, a steady and effective study routine, you should find yourself progressing and knowing Chinese faster than you could ever have imagined. Steve Kaufmann, who was able translate newspaper editorials from English to Chinese and from Chinese to English, read novels and interpret for people, learned Chinese in 9 months! Now, everyone learns differently and at a different pace but nonetheless, you can become fluent. In today’s post, I want to quickly go over a few Chinese grammar points that will prime you for your language journey and hopefully, make you feel less intimidated. The Chinese language is very merciful when it comes to verb conjugations. You’ll be happy to know that you don’t have to go through 20 different conjugations to change the effects of a verb. Verbs stay in their original form. In this aspect of Chinese grammar, the effect of the verb depends on the time phrases used in the sentence. I will sing on Monday. See how 唱歌 (chànggē) stays the same in all the sentences? But, in examples two and three “Monday” and “today” are used as the time modifiers. Adjectives in the Chinese language always come before the noun. This rule has always been in place, even before the decision was made to replace traditional Chinese as the standard with the now modern vernacular simplified form. He doesn’t like small dogs. She can sing high notes. Notice how all the adjectives are before the nouns. You’ll have an easy time modifying your nouns by remembering this rule. This Chinese grammar rule is a bit tricky, but it’s still relatively simple once you get the hang of things. Chinese is focused on the topic of the sentence. In English, the sentences are subject oriented. However, despite these rules Chinese allows for both subject and topic orientation of the sentences. Languages, I like to learn. While this grammar pattern is entirely correct in Chinese, it sounds a little unnatural when translated into English. However, if heard in spoken the Chinese language, it makes perfect sense. In these two examples, the ‘bag’ and ‘languages’ are the topic. If these sentences were made with the subject first they would be just as recognizable. As you may have noticed in previous examples, tenses remain the same. More specifically there is no distinction between future and present tense. Chinese grammar assumes that the content of the sentence is dependent on the situation at hand. I am going to the library to study Chinese. This sentence can have two definitions depending on the situation. In the first sentence, the speaker is describing where they go to study Chinese should the need arise. As compared to the second sentence, the speaker is CURRENTLY telling someone where they are going to study. LingQ has thousands of hours of great content that will help you become familiar with Chinese grammar. 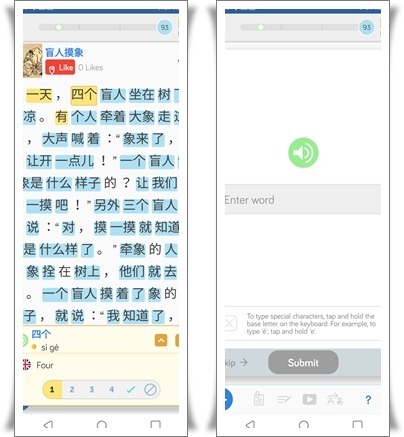 Rather than studying grammar rules from textbooks, you can study Chinese using content you love thanks to LingQ’s library feed. Not only that, but you can import your favorite Chinese articles, TV shows (from sites like Viki), Chinese YouTube channels, and much more into LingQ. LingQ will automatically create interactive lessons for you to help you study more efficiently. As you can see, you can easily read your content using LingQ. Look up words with a click of a button and save them in your vocabulary list. If your content includes audio, LingQ will be able to incorporate that into your lesson as well. To learn more about importing content into LingQ, make sure you check out this guide. Also, you can learn Chinese, or any language, using LingQ’s mobile app. LingQ’s language learning apps are available for both Android and iOS. Take your lessons on the go and study anytime, anywhere. Good luck. Short Writers Bio: Kiandro is an enthusiastic language learner. He holds a B.A in Asian Studies and is currently studying Japanese, Chinese and Korean. He favourite foods are ice cream and lobster tails.